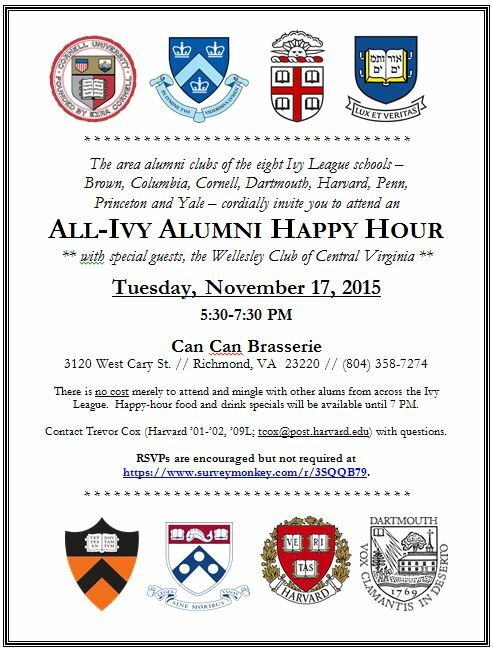 The area alumni clubs of the eight Ivy League schools invite you and your guest to attend an All-Ivy/Seven Sisters Alumni Happy Hour at Can Can Brasserie, 3120 West Cary Street, Richmond, VA 23220. (804) 358-7274. www.cancanbrasserie.com . Admission is FREE to mix and mingle with other alums from across the Ivy League and Seven Sisters schools. Happy-hour food and drink specials will be available until 7:00pm.